Each unit has its own procedure for internal routing, fiscal review, and Dean/Director approval. Some units provide proposal coordinators for their faculty. In some units, the business office provides support for proposal preparation. Note on missing signatures on the Routing Form: since the Routing Form is an internal document only, OGCA will not hold up review and final approval of a proposal to a sponsor when a signature is missing due to travel, fieldwork, or another reasonable absence by a PI, Co-I, or Dean/Director. The form can be finalized later and updated for internal records. All proposals for external research and programmatic funding require administrative review by OGCA Pre-Award (008 WRRB) *before* submission to a sponsor. OGCA-Pre reviews proposals by deadline priority and level of completeness. A minimum of five business days is required by UAF policy for review, any needed corrections, and approval. If a proposal must be reviewed and returned to the unit for mailing in less than five days, contact OGCA-Pre as soon as possible. We will always try to accommodate your "RUSH," but be cognizant of the fact that OGCA-Pre staff are also reviewing proposals brought in on schedule by other investigators or units. Note that proposals that involve cost sharing/matching, reduced F&A, or subawards will require more review time. All proposals OGCA-Pre reviews are reviewed through the Unit/OGCA electronic Shared Drive. The instructions on how to use the Shared Drive and obtain access are located here. 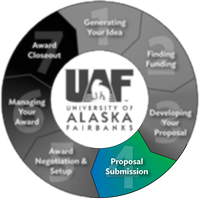 OGCA is the university's authoritative agent for the submission of proposals and acceptance of awards for sponsored projects on behalf of the University of Alaska Fairbanks. The authorizing signature of a UAF AOR or his/her designee certifies that commitments made on grants, contracts, and agreements can be honored, verifies the accuracy of information provided on grant proposals or contract agreements, and ensures that all sponsored agreements conform to government regulations, agency guidelines, and University policies. In order to fulfill this responsibility and to help UAF prepare the best and most competitive proposals, all sponsored project proposals for grants, contracts, and agreements must be reviewed and approved by the OGCA before submission to the external sponsor. OGCA review and approval is required for all proposals, applications, concept papers, contracts, and subcontracts, hereinafter referred to collectively as “proposals,” whether public or private sponsors, requesting funds and/or committing University resources (e.g. personnel, space, funds, equipment and facility use, etc.). OGCA review and approval is required regardless of whether UAF is the lead organization submitting directly to a funder or a subcontractor or collaborator, and regardless of the method of proposal transmission to the sponsor, e.g. via e-mail, paper copy or electronic submission. Even when a sponsor’s electronic system gives Principal Investigators/Project Directors (PIs/PDs) the authority to submit, OGCA approval is first required. The university has no obligation to accept awards that result from unauthorized proposals.